The AFK is a freelanced layout set in an imaginary country. Developing a credible coherent operating scheme in these circumstances is more difficult than in other situations. Copying a prototype with any degree of fidelity will require research into existing official literature such as working timetables and loco diagrams. 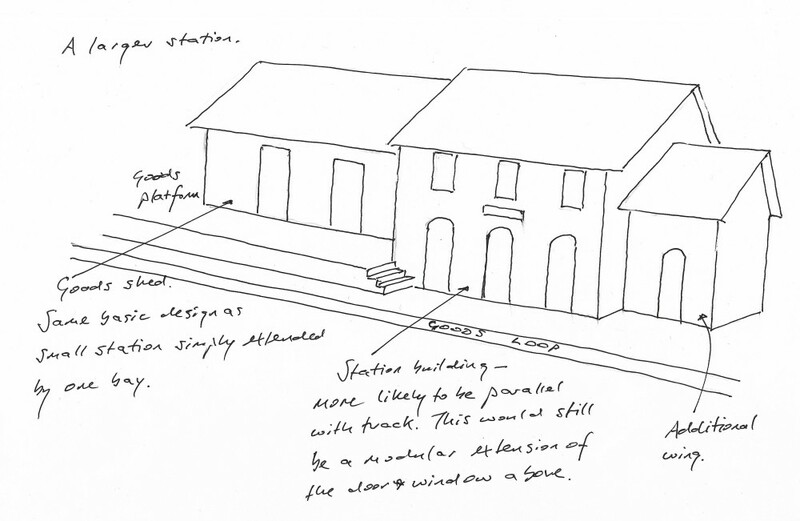 Creating a 'might have been' layout (based upon a plausible but unbuilt route) requires access to similar documents if it is to retain an aura of credibility. The problem for a totally freelanced railway is that it effectively exists in a void with no predetermined historical or geographical sources available for consultation. Freed from these constraining parameters there can be a temptation to develop a fictitious parallel world where developments diverge too widely from reality with the result that the layout becomes literally incredible. The layout builder takes the easiest route to resolving problems, operational or otherwise, with little regard for prototype practice, and indulges personal whims which contribute to this unrealistic environment. The AFK has tried to avoid these traps, not entirely successfully, but I like to think that it possesses a reasonably secure grounding in reality and presents a credible picture of a railway struggling to overcome its operational difficulties. A freelanced railway that seeks to gain a modicum of credibility must ironically begin with a knowledge of prototypical practices. The most obvious starting point for a line intended to be based upon operation is an examination of the nature of the train service provided by the real railways. In practical terms this amounts to obtaining timetables or a written analysis of the timetables of those railways. Having decided as an undergraduate that I wished to build a line similar to the French secondaires and the German Kleinbahnen I embarked upon as much research as the sources in various public libraries allowed. There was little available and much of early inspiration was drawn from the histories of British narrow gauge lines. Davies provided some insight into continental practices and rudimentary comparisons suggested that these were not too far removed from their British brethren. With the benefit of hindsight (and a large personal multi-lingual library) it must be said that the earliest attempts towards replicating continental NG procedures were surprisingly near the mark. This curtailed examination of the operating practices revealed a number of common traits. In all these cases the lines examined were common carrier railways which had a restricted sphere of influence and in essence served small local communities. (1) The typical train service was skeletal on the secondary narrow gauge lines. It was common to find a pattern of just three passenger trains running in each direction per day; one in the morning, one around noon and one in the late afternoon/ early evening being the standard offering. (2) Services ran as mixed trains, shunting the intermediate stations as necessary, with timekeeping being a secondary consideration. Where trains connected with SG services more attention was paid to punctual running. (3) On minor lines with a short run the service was designed to be operated by only placing one engine into steam. Where the line was too long to allow this the minimum number of locos were steamed to run the service. (4) The timetabled crossing of trains at intermediate crossing points was minimised as far as possible, although many continental stations possessed passing loops for operational flexibility. (5) When special services were run they had to generate sufficient revenue to cover running costs. By implication there had to be the prospect of a significant amount of traffic. (6) Speeds were slow, often hovering around the 10 to 15mph mark. (1) An initial phase when traffic was light and perhaps two mixed trains per day each way sufficed.. The area was incapable of supporting a SG railway therefore heavy traffic flows could not be expected. In most cases, this period was effectively the late nineteenth and early twentieth centuries. (2) The ‘heyday‘ of the line when traffic was relatively heavy (but not too heavy otherwise steps would be taken to convert the line to SG!). There might be four trains per day in each direction in addition to a separate goods train. This period could cover the 1900s to the 1920s but varied widely between different lines, often depending upon which country they were situated in. (3) A period of decline, usually coinciding with the later inter-war period, which saw the widespread development of competing bus and lorry services. In many places, the services reverted to the levels of the late nineteenth century. WWII, and its attendant oil shortages, often prolonged this period, allowing a number of lines to survive into the 1950s. 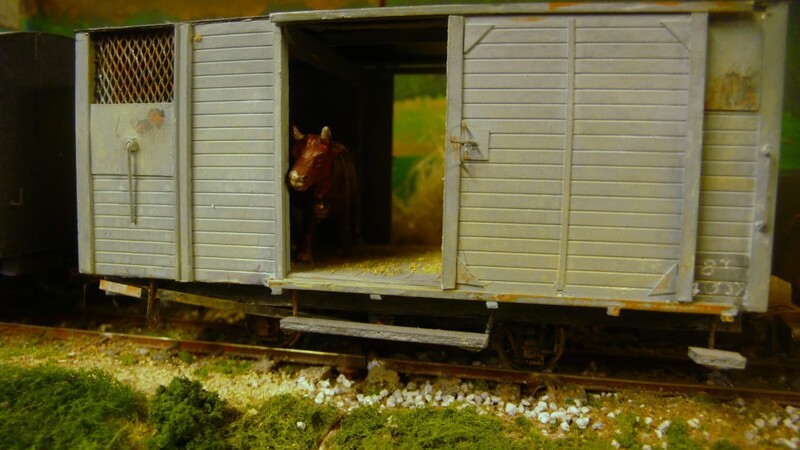 (4) The final ‘dying’ era which saw either total closure of the railway, or a lingering existence as a goods only line, sometimes converting solely to the use of SG transporter wagons, prior to the inevitable closure. (5) An alternative scenario was that the railways were thoroughly overhauled and re-equipped with fast, high capacity railcars, colour light signalling, welded rail and all the other accoutrements of the modern railway, including electrification in some cases. Italy, France and Spain provide examples of this re-invigoration whilst East Germany provided an alternative model whereby the Communist regime retained steam railways sufficiently long enough for them to directly enter the tourist railway era without ever being closed. The Mollibahn, the Harzquerbahn and the Rugen systems are good examples of this. These observations apply to small, locally important, common carrier railways. There were exceptions. Railways built to service extractive industries (such as the Festiniog or the CF de la Mure) usually ran a more intensive service with loaded mineral trains and empty wagons travelling between the mines or quarries and the transshipment point on a regular basis. Where the NG railway served a large city suburban services were provided with trains running at frequent intervals. As examples, the Catalonian Railways in Barcelona and the Stockholm services of the Roslagsabanan were electrified during the early twentieth century, although the outer reaches of both systems retained steam and diesel traction. The CP services into Porto remained steam hauled for much longer. In an alternative mould some NG railways acted as quasi-mainlines in a remote area. The Rhaetian Railway (or Rhatischebahn) in Graubunden provides one example, once its disparate constituent parts had been connected to each other and electrified during the early twentieth century. There were other examples such as the Reseau Breton and the now dismantled Yugoslavian 760mm lines. ECONOMIC, HISTORICAL AND GEOGRAPHICAL CONSIDERATIONS. This section undertakes a general survey of common practice. In almost every instance cited there was at least one exception to the standard template of provision. I am aware of many of these exceptions and sometimes they have been used as a justification for features of the AFK. British SG railways were conceived against a background of administrative indifference (laissez-faire) in an era of cut throat competition. Territorial wars were commonplace and there was no centrally conceived plan of an ideal network. The SG extended its tentacles to nearly all corners of the mainland and the NG was of tertiary importance, merely dotting the "i's" and crossing the " t's". On the continent a different approach prevailed. Governments quickly realised the strategic importance of railways and stepped in to control development. Countries were carved into monopolistic regions administered by one company and little competition was allowed. The mainlines were predetermined by government and the companies built those that fell within their allotted area. These SG companies avoided traversing difficult terrain and rural areas offering little prospect of lucrative traffic unless there was no alternative route available to connect major traffic centres. Faced with the prospect of large areas of the country potentially being devoid of railway communication the central governments devolved powers to lower administrative levels to build lines of local or regional, rather than national, significance. Given the remit handed to the main SG companies they owned or operated relatively few branch or secondary lines compared to Britain companies therefore there was scope for complex regional NG railways to emerge. The local authorities perceived such railways as being an important tool to develop impoverished rural areas. The main constraint upon development was the financial arrangements adopted. In some cases these lines were wholly financed by local taxation and in others the central treasury made a contribution. In either case extravagance was avoided and the railway was equipped and built as cheaply as possible. These constraints resulted in a number of broadly common traits irrespective of nationality. (1) They were predominantly narrow gauge because these were cheaper to construct than a SG light railway, although some SG lines were built. Often a standardised gauge emerged within one individual country. Ireland had 3 foot gauge lines whereas Switzerland and France chose the metre gauge. Austria adopted 760mm and the Italians used 950mm. Germany used both the 750mm and metre gauges as well as 600mm, although the latter was effectively only used on rural tramways. (2) There was a standard portfolio of operational and equipment specifications based upon whatever each individual country considered to be best practice. There was a general consensus of this although there were slight variations between countries. As a result the NG railways of any individual country tended to have a familial appearance. Britain never seriously attempted to develop a theory of best practice resulting in neighbouring lines often being equipped in vastly differing manners. (3) The routes of continental lines were determined by the local authorities rather than private enterprise. Lines could gain easier access to the communities that they served than their British counterparts because the authorities owned the highways and could decide issues such as the siting of stations in conjunction with the local communities. Where there was dissension between rival villages there could sometimes be a remotely sited station serving neither very well. This was a more common feature of the British NG because the land had to be bought by the company and urban property was expensive. Continental lines also tended to provide links between adjacent SG lines rather than following the British template of running from a SG junction to a remote isolated terminus. Many continental NG railways developed into complex systems serving a number of SG junctions. There were anomalies however. Where a line had to cross an administrative boundary it was not unknown for the neighbouring area to refuse to sanction the line resulting in a terminus in a small insignificant hamlet. (4) The local authority usually only wished to encourage railway development rather than to become a railway operator. The day to day management was often subcontracted to a lessee who was paid an agreed rate with any profits above this being split between the lessee and the administration. Specialist companies evolved to operate minor lines, some of whom acquired large portfolios of unconnected lines. The Chemins de Fer Departmentaux (CFD) was one such example. As outlined above the typical continental NG line was paid for by the administrative authorities. This had implications in the provision of facilities and the selection of route. The need was to provide an economically constructed and operated railway serving local needs rather than one equipped to mainline standards. The elected bodies financing these railways were aware of the need to avoid extravagant spending upon ostentatious facilities and attempted to pare their expenditure to the minimum commensurate with sensible provision. In some cases this descended in to parsimony rather than economy, particularly in the British context where impecunious companies struggled to make ends meet. Once again certain characteristics can commonly be found. (1) The continental authorities had much more latitude in their choice of route. This resulted in significant differences from British practice at the more extreme ends of the scale. (i) At the most economical level of provision the local council's responsibility for highway maintenance allowed them to use the roads for the course of their railway. In rural areas outside the villages the grass verges alongside the road could be used at little or no cost save for some rudimentary grading. When the line approached a built up area the train simply pulled out into the middle of the street and ran through the village like a tram. (ii) For more important lines substantial engineering works were authorised, although there was likely to be a subsidy from a higher level of administration. Large viaducts still grace many European rural districts long after the NG has disappeared and in other places long tunnels, complete with ventilation shafts, were dug through remote hillsides or under hilltop towns. (iii) Most lines avoided complex engineering projects and were better financed than those which ran alongside roads. They were more conventionally engineered, running through the countryside on their own right of way, which included embankments and cuttings, and locating stations at the edge of villages where the line crossed a road. A very few lines, rather incongruously, managed to exhibit the features of the two extremes. The Sicilian lines, in particular, managed to combine considerable tunnelling and viaduct construction with middle of the street running. 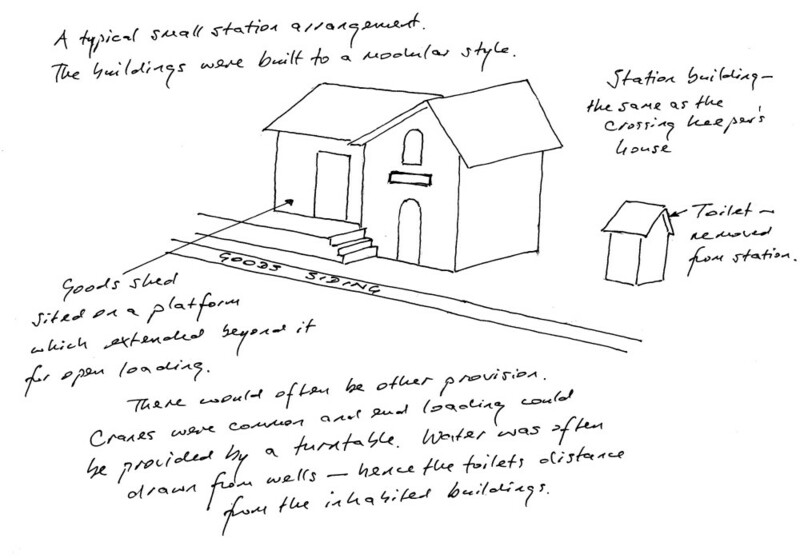 (2) Station buildings, and other buildings, were built to standardised plans. There were concessions to local building materials and decorative styles but the overall design arrangements were very similar across Europe. At a small station a main building with two doors and a gable end parallel with the track provided living quarters and passenger accommodation such as ticket/parcels offices and a waiting area. 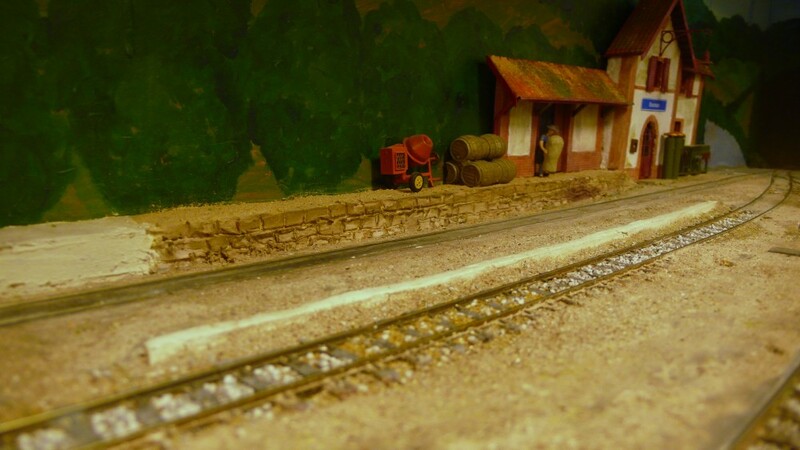 This was flanked by a goods shed with the gable end perpendicular to the track and which stood upon a loading bank. The buildings were attached to each other rather than being separate, as was usually the case in Britain. The toilets were placed in a separate building, usually at some remove from the main building! More important stations had larger buildings and goods sheds but followed this basic template. 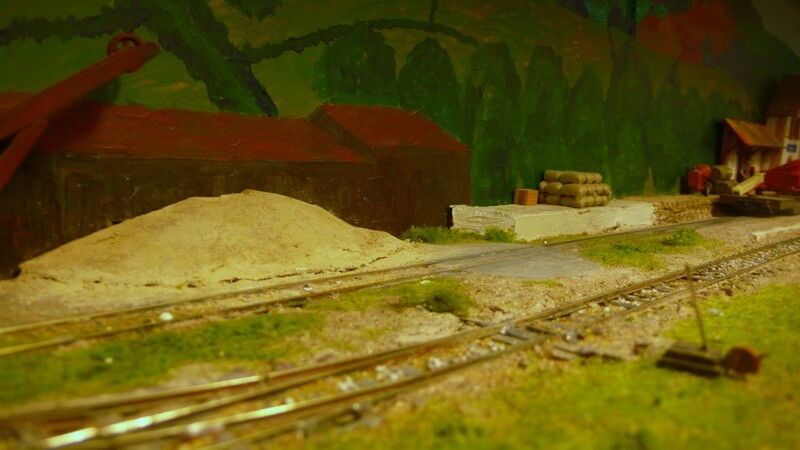 Sometimes another wing was added on the opposite side from the goods shed. Many NG railways built their own separate facilities at junctions, duplicating those of other railways, and it was not uncommon in some French towns to find three sets of buildings standing adjacent to each other in a quartier gare. Although presented in very low relief this is an example of the typical wayside station, with an annexe at the right for additional living quarters. The lavish provision of signalling equipment is atypical as most minor lines had little or no signalling. An attempt has been made to copy French building styles whist individual touches have been added such as the hanging lamp and the clock. The tinplate nameboard on the building was typical practice. There was no other indication of location to passengers unfamiliar with the area. The station is built at a convenient road crossing in the countryside. 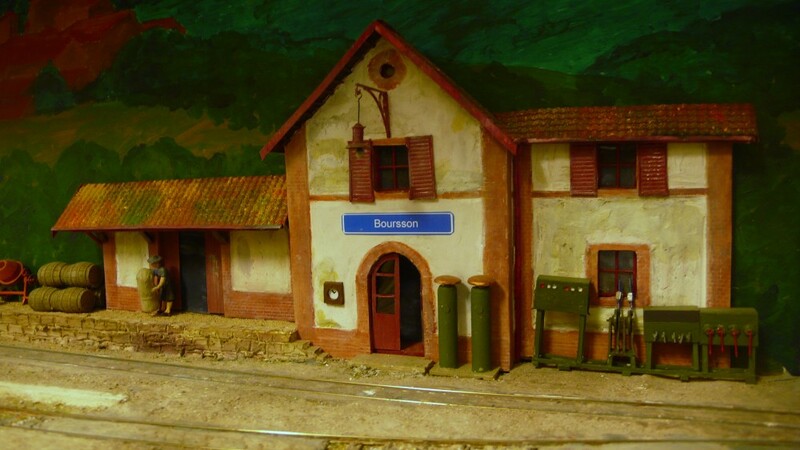 There are a number of villages incorporating Boursson into their name so the station was built at the most convenient location for the railway between the various settlements. 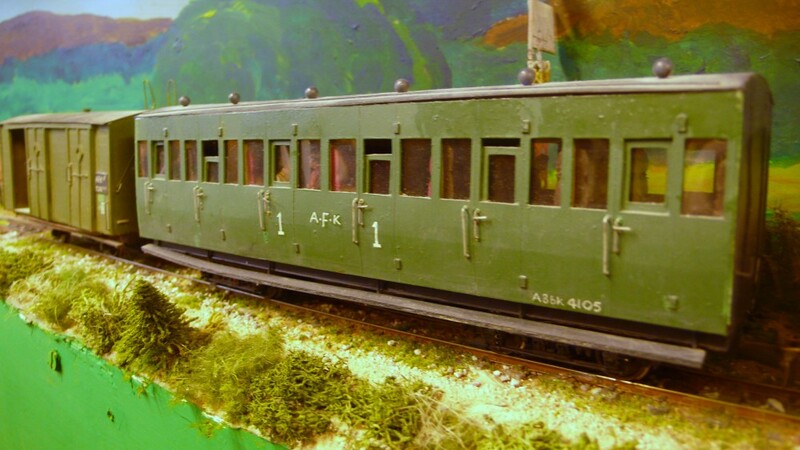 A view from further along the loading bank emphasises the very low relief nature of the model. Some later extensions to the bank have been made in concrete to emphasise the idea that the AFK was not all built in a day. The rudimentary concrete edging is the only concession to a passenger platform. The area between the loop and the mainline in the right foreground is an unsurfaced area which acts as a second platform. There is a wagon turntable at the end of the goods loop and a bevelled edge to the loading bank. This allows a wagon to be turned to be square on to the bank to allow for end loading when necessary. I would have liked to have run a siding around behind the station but there is insufficient space therefore the pile of sand sits next to, and across the goods loop. The joint line of this is obvious unfortunately as it has to be prised off occasionally to access the microswitches for the point crossings. The hand thrown lever in the running line was typical practice, although here it is locked under the scußelwerk method of operating. 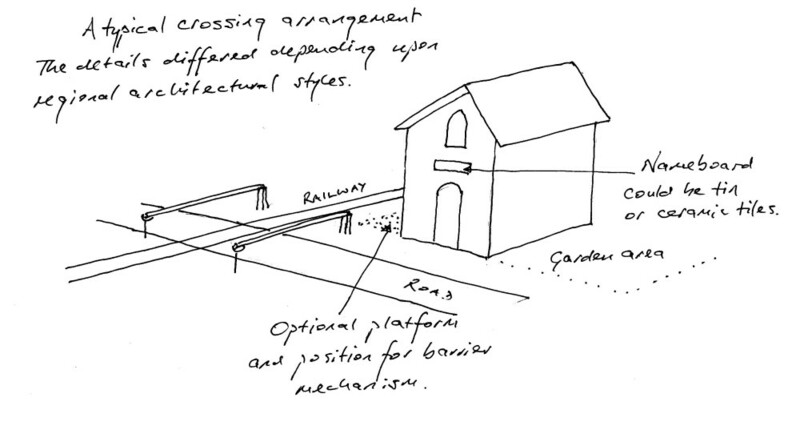 (3) The station track layouts were usually taken from a standardised template. Loops were included, which at first sight appeared to be running lines, but which were in fact double ended sidings designed to be shunted from either direction with equal ease. 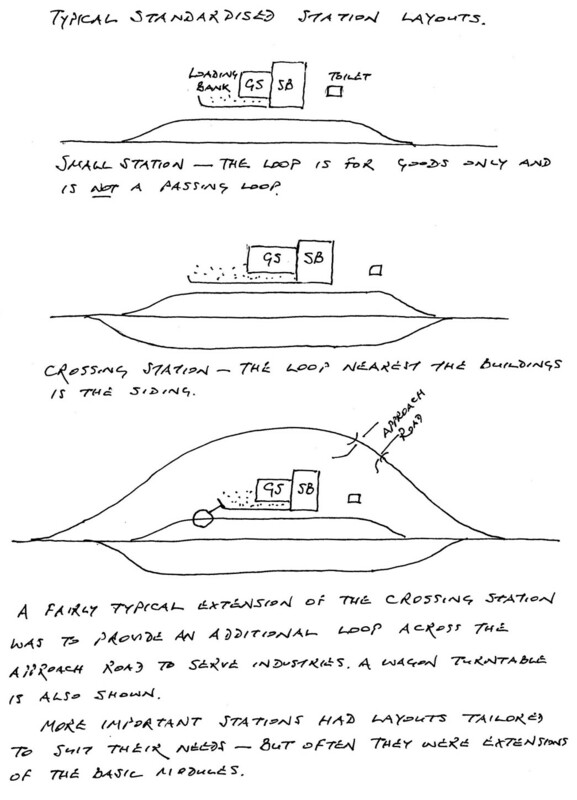 Passing loops were frequently provided, even though little use was made of them, because they provided operational flexibility. (4) Signalling was rudimentary and in many cases non-existent. The complex locking frames and signal levers, provided at great expense upon the insistence of the Board of Trade in Britain, were absent. Points frequently had no locking devices and were operated by hand, thus allowing for the easy provision of passing loops noted above. Signals also were often absent, although the German lines sometimes provided an entry signal to a station. Departure was authorised by a handsignal from the person in charge of the station. German lines tended to prefer a little more centralised control of the infrastructure and it was not uncommon for there to be a small frame on the platform, beside the stationmaster's doorway, which controlled the loop points and entry signals. Movement of trains between stations was controlled by telephone with the operators at either end of the section verbally agreeing that a train should enter a section. (5) Locomotives and rolling stock superficially appeared to vary to a greater extent than any other aspects of provision but they were, in essence, almost identical. There were obvious visual differences, reflecting national preferences and the individual practices of loco builders, but the basic provision was based around small tank locos. Many railways were initially equipped with a limited number of loco classes to simplify maintenance. The locos were frequently long lived because the initial provision proved adequate and traffic remained at a low level, although larger locos were sometimes added in later years. Some lines were at least partially equipped with diesels during the interwar period in an effort to cut the running costs. Railcars were popular in France and Ireland as a means of economising on passenger service provision. The 0-6-2T, number 707, was designed to be a deliberate pastiche of French minor line practice. 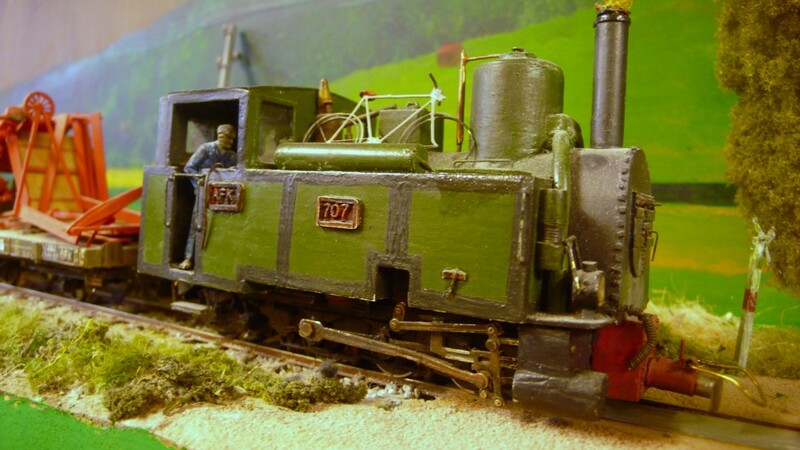 The model shows a loco later converted to oil firing. Individual features such as the outside steam pipes from the dome, pressure valves on the dome, the water level indicator on the tank, the oil lamps, the two part smokebox door and the (alleged) Joy valve gear have all been taken from individual prototype examples to create a generic whole. The loco meets the template of a small four or six coupled tank loco with outside valve gear to simplify maintenance in rural workshops which was typical of continental practice. (6) Rolling stock was usually four wheeled at the opening of the line, even including the carriages. Rolling stock was cheaper to buy or modify than locos therefore carriage provision was sometimes upgraded to bogie vehicles. Ironically, in later life, the bodies were often removed so that the underframes could be used to provide high capacity goods vehicles. The goods stock also excluded exotic types of vehicle and was formed of vans, opens and flats. The vans had opening vents in their sides to allow them to transport livestock. This stock was supplied in the lowest quantities possible to meet the anticipated traffic demands (unlike the typical model railway!) and only expanded when it became evident that more was needed. A simple bogie coach provides accommodation for passengers. Each country had its own template for such stock although many lines exhibited individual preferences. Compartment stock was relatively unusual but was found in France. A personal dislike for open balconied stock (don't know why!) means that it is not found on the AFK. The fourgon or brake brings up the rear. Brake compartments in continental NG stock were rare but not unknown. Typical stock for a NG line. It could handle most things thrown at it, especially where officialdom was lenient. The standard NG van had vents on each side, although these varied in number. Some AFK vehicles have two and others have eight although four is the most common arrangement. They could be opened to transport livestock. These cattle are supposedly tethered, accounting for the doors being open. Note the straw and sawdust on the floor. Somewhere or other there is also a van with a brick in the door, which was tied to keep it closed but still provide ventilation. (7) Complex, expensive installations such as loco sheds were kept to a minimum. Their geographical location upon a small line affected the pattern of train service. Often, in Britain, the shed was located at the terminus which demanded that the first train of the day ran towards the junction and the that the last ran towards the terminus. There were exceptions to this pattern and some longer lines had to provide subsheds in outlying locations. These were often uneconomic and closed wherever possible once diesel traction became available. (8) Although it is tenuous in a model railway context, it is interesting to note that a large proportion of the NG railways' labour force was women. This tended to be for economical reasons rather than philanthropical reasons! Their husbands were employed in some capacity by the railway and provided with subsidised accommodation of which a condition was that the wife took on a subsidiary role. A common combination was that of the wife of a track ganger operating a level crossing or small halt. There was, of course, the added bonus for the management that the ganger was contactable by telephone in a remote location in the middle of the night should a problem arise! This section has attempted to identify some common features of continental NG lines. For many modellers these are probably minor background considerations of relatively little importance but, hopefully, some readers will find this analysis useful. For the AFK they provided a template offering guidance in the decisions made in designing the railway.